Lawyer-turned-businesswoman Meledah Twahira in her shop (file photo). A study by Boston Consulting Group found that startups founded by women receive less than 50% of the investment received by those founded by men, but achieve 10% higher profits. In Africa, women founders are still sufficiently small in number to be considered remarkable rather than an every day reality. Russell Southwood talked to Alitheia Capital's Tokunboh Ishmael about a launching a Gender investment fund. Tokunboh Ismael has a long pedigree of working for investment funds in West Africa and elsewhere and a stint as a banker at Saloman Smith Barney. She moved back to Nigeria in 2003 to run an SME investment fund:"We wanted to pioneer private equity and were looking for cash-generating SMEs. But we found that the idea was not meeting the reality on the ground." But her motivation for starting her own fund had its roots in her time as a banker. She would occasionally look out the window and think: what if we could generate the sort of wealth we do for mergers and acquisitions to solve the problems on the streets in Africa? :"For example, I knew that indoor pollution was a killer of infants and thought that can't be right". She set out to make money by investing well but doing good:" The first mandate was for financial inclusion. We wanted to invest in microfinance banks and do it with DFIs and Goodwell Investments". They set out to use the model Goodwell Investments had used in India. "I had a background in technology so I asked why are you using paper and why are staying just local? Tayo (Oviosu, Paga) came to me asking for US$20 million to market a tech firm. I said you don't need US$20 million for marketing. You need money but not so much. This was our first fintech investment. Wim from Goodwell said:'You're not serious, are you?' It was a complete start-up with no licence for mobile money. "He said:'This is not why we've been given money. We've been given money to drive financial inclusion'. Eventually I convinced him. Recently we made our fourth investment in Paga and it took 5 minutes to approve," she says with a smile. Under this mandate, it also invested in Oradian and Lidya. Oradian provides cloud infrastructure for micrcofinance banks and helps them link-up their branches and improve their overall infrastructure. 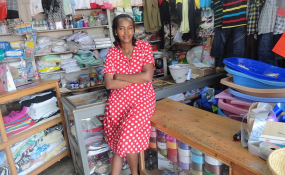 Lidya is an SME digital finance leader and has created non-traditional means for scoring loans and offers this to microfinance banks among others. When she looks at start-ups, she's searching for good management teams:"We want to build a relationship with them. Their energy is key and we put that above experience. We know the energy founders need to have to bring things to the table". "The other side of what we do is gender inclusion. We've seen what female entrepreneurs expansion is getting capital. We proactively look beyond the traditional industries and entrepreneurs". She quotes the Boston Consulting report published last month that found that startups founded by women receive less than 50% of the investment received by those founded by men, but achieve 10% higher profits. "We're looking at fashion, creative businesses, beauty and textiles. There are some players who will emerge as the Mac (the Estee Lauder-owned cosmetics company) of Africa. We are looking at aggregation platform opportunities that will bring order and structure into the value chain. Many of the participants (in these sectors) are women. It's the same with smallholder farmers. It's about being able to bring a gender conscious approach from the boardroom to the factory floor". "It's a frustrated culture. We need to bring greater access to the market and sell beyond Nigeria and South Africa. This would have a huge impact on these SMEs and would give more presence to the sector". To do this it is launching a gender fund that will have between US$75-100 million to invest and its first close will be announced shortly. She sees interesting crossovers between her fintech investment work and the planned investment in African women start-ups:" Interesting female entrepreneurs with solar products for smallholder farmers and there are interesting financing models we use with them... Looking at other off-grid apps, what's the tech that can enable things as m-Kopa has done? It's a consumer finance mechanism". It also has Access to Energy Fund of US$20 million, which was funded by DFIs and by a Nigerian corporate, the oil marketing retailer Oando:"It wanted to broaden access to its products. We helped them to do energy financing and products for distribution for bottom-of-the-pyramid households. We also have a couple of access to energy initiatives with Shell, which have now been spun out as a separate organization:"It's about how to improve stability for those on the ground". So where does it look at investing in Africa? :"So far it's been just in the hubs of Nigeria and South Africa but soon it will also be East Africa. We want a broader umbrella of impact investing. We want to be solving the problems of access to market and the supply of basic goods". She sees enormous potential in Africa's consumers, particularly women and throws out a challenge:"How do we leverage tech across different industries? We've got basic user end data. What can we now do for them?" This article was originally posted on Smart Monkey TV. Copyright © 2018 Innovation in Africa. All rights reserved. Distributed by AllAfrica Global Media (allAfrica.com). To contact the copyright holder directly for corrections — or for permission to republish or make other authorized use of this material, click here. Can Artificial Intelligence Help Victims of Domestic Abuse? Can Drones Alone Save Africa's Elephants? Are the Days of WhatsApp Chain Messages Numbered? Africa: Fund for Africa's Women Entrepreneurs to Break New Ground?